Would you like to quickly introduce yourself to our readers? Okay, so firstly hello to everyone, I am a tick and some of you may have seen some of my friends and family around already. We are pretty social creatures and you can find us in most places – including on your pet! Not many people know this, but we are related to spiders and scorpions and have eight jointed legs, which are very handy for getting around and even greater for hiding away quickly if we need to. Could you just describe what you look like for some of our readers who may not have met a tick before? Yes, of course, I have a small head (that’s not to say I am not intelligent, mind, it’s just more compact up there), my eight legs and a smooth oval body . Size-wise I am about 2.5mm in length (not bad for an adult male tick of my age!) Female ticks tend to be bigger as they expand when they feed - my wife can expand from 3mm to around 10mm after she has been feeding! The colour of my body varies, and when I am unfed, I tend to be black in colour but I turn a very becoming brown-grey colour after feeding. Some of my other tick friends are brown in colour and turn a salmon pink or purple colour after feeding. What’s your favourite time of the year? I really enjoy both the spring and autumn, as it’s just the right weather for ticks like me (warm with plenty of moisture in the air) and it’s when my friends and I are most active. That said, I’m partial to a bit of summer sunshine (not too hot, mind!) and a mild winter. Tell us, where do you and your tick friends like to ‘hang-out’? Every tick knows to stay out of any direct sunlight, as it can quickly dry us out. Long grassy areas, and spots where there is dense vegetation, are perfect. Woodland areas are also great, as there are always plenty of leaves and pieces of bark to shelter under. Personally, I hang out in the local park with some of my tick buddies, it’s a great spot as there are long grasses and bushes to hide in. Finding a meal is easy too, as there’s lots of wildlife around and plenty of cats and dogs also visit the park. I generally like nothing better than to perch on a blade of grass or on the edge of a leaf with some friends and wait for an animal or person to brush past. I can then hitch a ride and have a bite to eat at the same time - what an adventure! How did you meet your tick wife and do you have any offspring? It all happened one spring when I was a young adult tick just waiting for my first meal. A keen young wire-haired terrier brushed past the piece of grass that I was perched on. So, I took the opportunity to climb on board and that was when I spotted her, she was sat feeding just inside the terrier’s left ear. Well, to cut a long story short - we hit it off immediately and decided to start a family there and then. We were very blessed and had 2000 lovely tick babies together, who are now growing up and busy travelling the country. This is an easy one; my favourite food is blood, which I get from feeding on hosts such as mammals (e.g. foxes, rats, mice, hedgehogs) and birds. I generally feed for a few days then once I am full I will drop off my host back onto the ground. What sort of things do you dislike? My number one dislike are the FRONTLINE® spot-on products (FRONTLINE® Plus and FRONTLINE® Spot On), which are toxic for us ticks, and a lot of pets seem to be wearing them these days! They basically kill ticks within 48 hours of contact with the product. Many ticks won’t even have had the chance for a last feed. Every tick knows a fellow friend who has fallen victim to a FRONTLINE® spot-on product..
Other dislikes include hot dry weather, as we can quickly become dehydrated and die! Oh, and pet owners that groom their cats and dogs regularly - this is very unfortunate for us, as combs and brushes can easily result in a tick being decapitated! Some of them even use a special tick remover to twist us out of our spot! On a more positive note, what things do you like? I love warm, humid and damp weather and pets that have not been treated with a FRONTLINE® spot-on product. Have you ever done any travel? No, but just recently I have noticed an increase in the number of exotic tick relatives that are arriving in the UK. They seem to hitch a ride back on pets that have travelled with their families abroad. Many of these guys can survive over here, as long as they live indoors in shelters or kennelled areas. What are the downsides of being a tick? 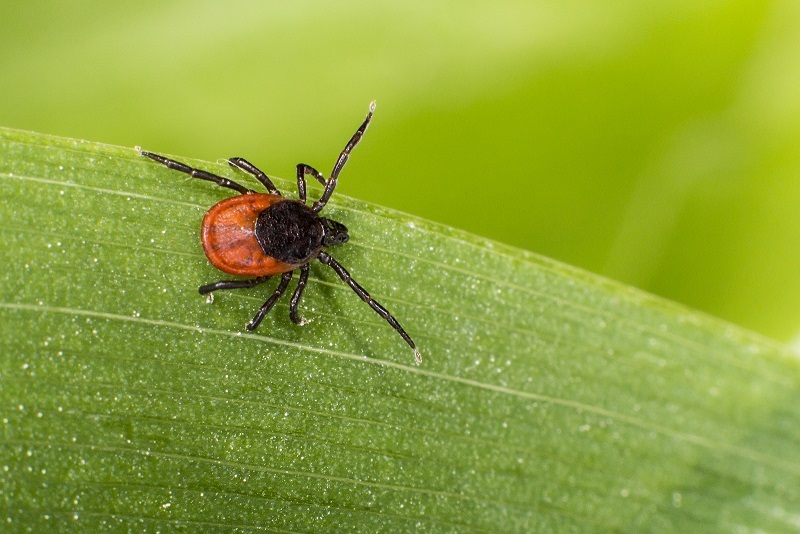 Sadly, some of us ticks can carry nasty infections that we can pass onto our hosts as we feed, causing serious diseases like Lyme disease and , canine babesiosis. This is not something that I am proud of, as we only want to grab a meal. Thank you so much for your time today, I hope you have a good journey back to your park. This interview with a tick is fictional and written for educational purposes. FRONTLINE® Plus contains fipronil and (S)-methoprene. Legal Category: NFA-VPS (UK). FRONTLINE® Spot On contains fipronil. Legal category: AVM-GSL (UK). Health Ltd 2017. All rights reserved. Merial is now part of Boehringer Ingelheim. FRONTLINE Plus contains fipronil and (S)-methoprene. UK: NFA-VPS. FRONTLINE Spot On contains fipronil. UK: AVM-GSL. Further information available in the SPC or from Merial Animal Health Ltd, RG12 8YS, UK. FRONTLINE is a registered trademark of Merial. ©2018 Merial Animal Health Ltd. All rights reserved. Merial is now part of the Boehringer Ingelheim Group of Companies. Use Medicines Responsibly.